and load balance printers and print server. 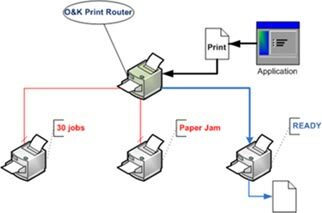 O&K Print Router is a program for simultaneous printing on any number of printers. Print speed up the process. Each copy of a printed document is saved as a PDF. Custom user scripts for faster printing and balancing load between multiple printers. Using O&K Print Router printing speed of printers increases several times. Automatic load balancing allows you to select the most affordable and ready to print the printer. This allows you to evenly distribute print documents on your printer and significantly reduce the time of printing documents. Redirect print job to multiple printers. 1Run O&K Print Router UI. 2Select printers to redirect to. 3Print any document to O&K Print Router printer. This document will be redirected to each selected printer. 3Set the option Load balance. No multiply printing. 4Print any document to O&K Print Router printer. This document will be redirected to one the most affordable and ready to print printer. Save a printed document copy. 1Set the option Save the printed document as PDF. 2Print any document to O&K Print Router printer. 3The copy of printed document will be saved as PDF. How to create several rules sets for different printers. 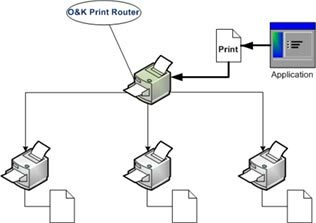 Install an additional virtual printer in O&K Print Router. Fast and efficient printing on multiple printers. Speed-up printing and distribute load among several printers with O&K Printer Router. How to create custom user scripts to redirect printing and balancing load between multiple printers.